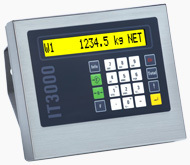 IT 3000Truck/Online is a weighbridge terminal designed for the set-up of rational and user-friendly weighing positions. Thanks to the construction inside a compact and rugged stainless steel housing (IP65), the equipment can be used under any, even most severe operating conditions. The weighing terminal can be table or wall mounted. Handheld transmitters are recommended for more rapid and easy operation. The weighing voucher contains the weighing date, and time, the first and second weighments and the net weight. Because of the certified intermediate saving of the first weighment, the voucher is only released when driving out. This speeds and simplified the overall process. The voucher can be printed and eventually adapted to any layout. This stand-alone piece of equipment can also be upgraded by fitting a PC scale on it. Provided with internal Alibi Memory, RS232 interface, and variable print image formatting. In the Online mode, the operation is controlled by connecting the terminal to a PC. The terminal is designed to process certified weighments and save them in the Internal Alibi Memory.